Astro Technicals: Astro Technicals- Saturn 2012 to 14- A comparison with the past. 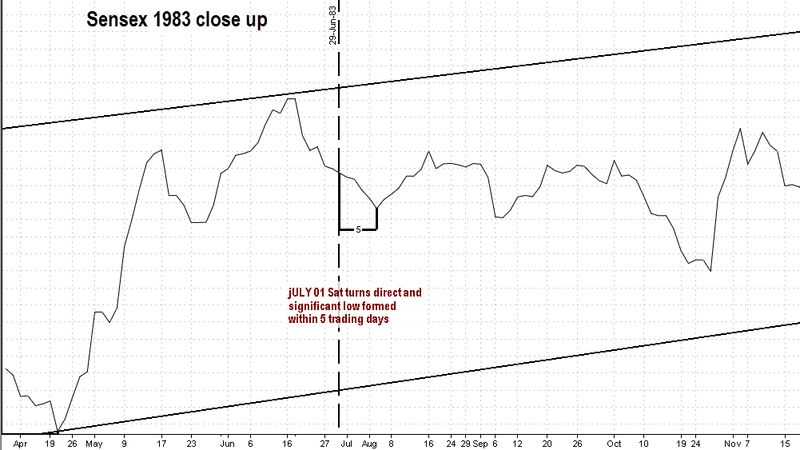 Astro Technicals- Saturn 2012 to 14- A comparison with the past. 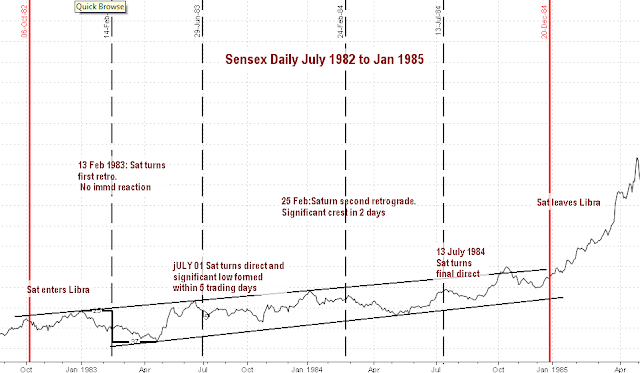 We can see the entire period was one of steady uptrend interspersed with prolonged down trends inside the up channel.Since in 2013, we are in the period of Saturn about to become direct in its first retro effect for the current passage, we want a closer look at the similar situation then. To elaborate what had happened when Saturn became direct after its first retro passage? On July 01, 1983, Saturn turned direct and a significant low was formed in 5 trading days.But even after rise the overall decline continued.Low or high can be considered as a reversal only and not literally. First the uptrend seems to be seen again, in clear channels. Amplitude seems to be more exaggerated maybe because Rahu is there with Saturn to increase the power of Saturn. What could happen when Saturn turns direct on July 08, 2013? Markets are rising towards the stationary direct situation. Given an orb of 5 trading days, we could possibly see a crest forming.. that is on or before July 17, 2013.Interesting thing is overall trend seems to be up..Now will Jupiter in Gemini cause a hiccup to the long term up trend? We will have to wait and see!